Today for Day 11 of our 12 Days of Christmas Movie Reviews we will take a look at Ron Howard’s How The Grinch Stole Christmas (2000). This is the live action remake of the 1966 cartoon of the same name. There is much to say about this movie, from consumerism to bullying to animal cruelty. But lets start with a quick recap. The film takes place in Whoville, which is populated by the Whos. The Whos love Christmas, but what they really love is buying presents. 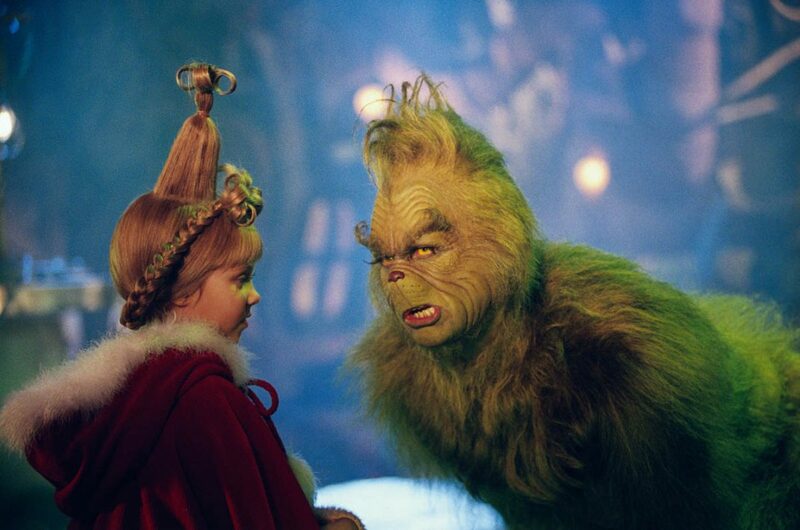 The title character, The Grinch, was born in Whoville but never quite fit in. This may be because he inexplicably has green skin and fur, or because he is a bit socially awkward. Either way, the Grinch decides it is best for him to run away to Mount Crumpit. Years later Cindy Lou Who decides to try and bring him back to the community. Through some dirty tricks by Mayor May Who the Grinch was once again driven from town. At this point he decides to steal Christmas from the Whos, with the help of his trusty dog Max. Despite all that the Grinch has been through I think Max has a rougher time than the Grinch does. Its hard to be friends with a Grinch. Through all of the zaniness that ensues the Grinch manages to steal every last bit of Christmas in Whoville. But despite all his thieving the Whos still come together to celebrate the true spirit of Christmas. The Grinch is so moved that he returns all the gifts and he is welcomed back to the community. Now just for a little background, several of us here at ItsJustAwesome.com met while working at a popular retailer. This gave us a first hand view of the rampant consumerism that really comes into its own this time of year. Its great to see this whole system broken down by little Cindy Lou Who early on in the movie. While the movies uses the term Christmas, I think it could easily be a commentary on what it means to simply be Kind. Just like Christmas, Kindness doesn’t come in a box with a bow, and sometimes you have to lose everything before you’ll show it to others. Its also worth noting that this movie was nominated for three Oscars and won one, for makeup. The entire look of the film captures the look and feel of the original Dr. Seuss book. Its goofy and silly and filled with lots of practical effects that make the world come alive. And yes, the makeup is great. But no matter how much makeup you pile on his face Jim Carrey still shines through. The Grinch is silly, cartoonish, and full of over the top humor. But at its heart it the story of finding the true meaning of Christmas. Tomorrow Charles will finish off our 12 Days of Christmas Movie Reviews with Elf (2003). On a serious note, in recent days bullying has become such an issue that there is actually a website setup by the US government, StopBullying.gov, to try and prevent it. Now I’m not going to say that everyone that is bullied will become a Grinch who steals Christmas, but it certainly is a real problem.